Precision Shooting Magazine is folding. Editor Dave Brennan announced that the respected print magazine will go out of business after 56 years of publication. This is a sad day. Precision Shooting was a serious journal that advanced our understanding of firearms technology and excellence in the shooting sports. Among the writers for the magazine were many talented shooters, gunsmiths, machinists, and engineers. 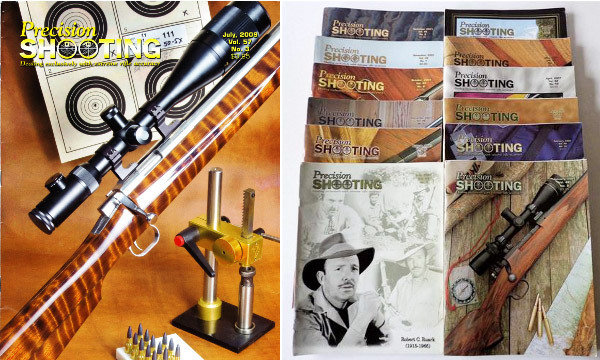 Over the years, Precision Shooting articles (and bound books) have spotlighted major advances in barrel-making, stock design, bullet design, optics, and much more. 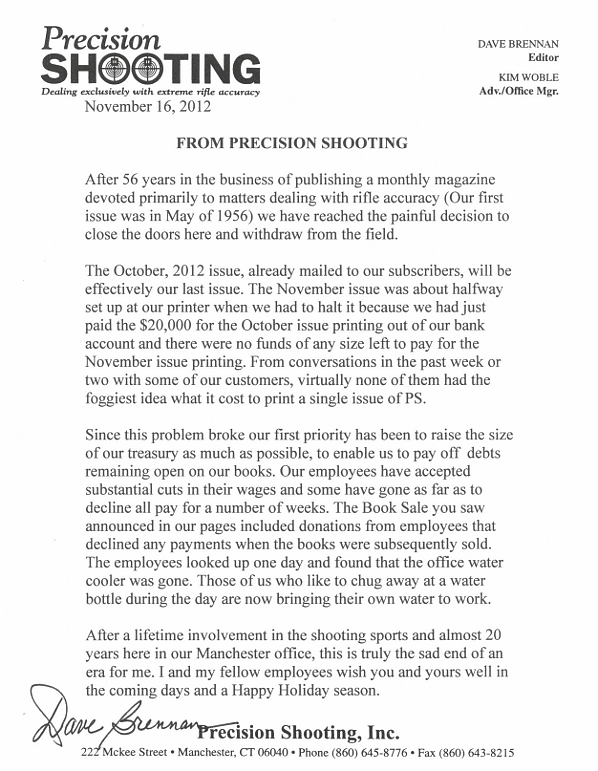 We are sad to see Precision Shooting close its doors after more than half a century. Editor Dave Brennan, his employees, and his ranks of writers are to be commended for giving us so many years of interesting and thought-provoking reading. Share the post "Precision Shooting Magazine Shuts Down after 56 Years"
panic attack from news of a lost source of good accuracy info long time subscriber I feel that I got my monies worth. If a complete set of these publications were available on cd/dvd I would certainly purchase it. I had piles of Precision Shooting magazines in the attic of the home of an aging family member. Last I checked, the raccoons must have enjoyed them immensely. My only consolation was that I had far from a complete set. Anyone else have an idea of how to capture the information before its gone forever? This is truly a monumentally sad occasion. Thank-you to all PS staff and writers for your guidance and wisdom over the years. Perhaps a cd of all issues could be released in order to boost creditors renummerations. how do I find the value of my P S magazines I have about 100 copies in perfect shape from Nov. 95 to Feb. 2004 including the Oct.1999 Vol. # 47 #6 which includes the Houston warehouse article by Dave Scott. Did you discover whether or not PS is available on CD ? I am looking for a very specific copy of the Accurate rifle magazine that covered the L42a1 titled queen’s last soldier, anyone has that copy? I would have gladly PAID DOUBLE FOR THE SUBSCRIPTION. Maybe if you went electronic like SOLDIER OF FORTUNE did. This, I would think, would be a way to control overhead I was sorry to see it come to an end. It provided invaluable info. Do what Soldier of Fortune did. Go electronic. They no longer print a mag any longer. The cost got to them too. I am really glad this has been rebooted. I have have been saying much the same over the past few weeks – we are the poorer for not have Precision Shooting. Internet Forums are drivel and most blogs much the same. A decent journal that caters for deeper thought and discussion is really needed now. We could group scan? Do one magazine each and send to a central repository? Maybe someone will do as the publishers of “Handloader” and “Rifle” magazines did; re-issue the ENTIRE series on disk. I already had issues 1 to 156 of “Handloader”, when I encountered the publishers at a SHOT Show. I immediately ordered “The Works” on disc and they duly turned up a couple of months later (I’m in Oz). HOWEVER, it is the information contained in all those back-issues that is so valuable. I didn’t know SOF had stopped printing. I have a few of those tucked away, including the very first one, sadly, some comedian had torn out the infamous “head-shot” photo from an otherwise VERY tidy sample. Is Dave Brennan still around? Can someone from 6mmbr ask the IBS what is possible? The Precision Shooting magazine accepted and cashed my subscription renewal check then promptly ceased publication. No refund was forthcoming. I have come to expect honorable behavior from folks I’ve met in the shooting community. The failure to return my money was a big disappointment and demonstrated a lack of honor and decency on the part of the publisher. I am the gun maker pictured on the cover of your 1987 May issue by Lee Teter. I just saw the magazine cover and thought you would like to know. I am pleased to see my picture on your cover. I was building a Leigh Valley rifle when Lee painted me working in my shop. Go to my web site and you will see a bit of my work plus a rifle honoring the Marine Corps I just finished.